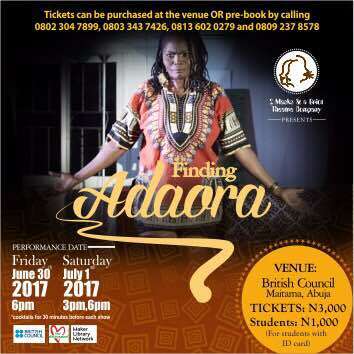 FINDING ADAORA, a stage play, created and written by Roli Ukwu and Segun Michaels debuted at the British Council on May 27th, 2017 (read Here)with an excellent turn out and good reviews. 2 Mask & A Gariot is happy to announce that come June 30 and July 1, 2017, the Theatre production, comes back to the British Council, even better! If you missed it before, don't miss it this time! Bring a friend or two along as well. They'll thank you for it!